Newspaper headlines continue to report disasters, bombings, fires, flooding, propane leaks, storm damage, tornadoes, and train derailments. Responsible organizations are recognizing the importance of pre-disaster planning. 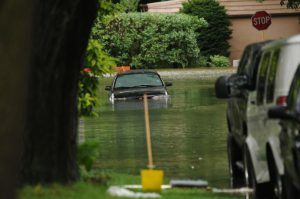 Flooding is a common cause of business disaster. Is your company prepared? In today’s highly competitive business environment, planning makes the difference between success or failure, profit or loss. Any disruption of normal business operations, no matter how small, places your business in jeopardy of losing clients. In order for your business to successfully weather a incident of disastrous proportions, your company must be prepared. Does your company have a plan if disaster strikes? If the unforeseen happens, can your business implement a planned, tested response and activate recovery procedures to minimize damage and loss? Will the response be quick enough to minimize damage to customers, business reputation, business assets? Should a disaster incident impact your business, a planned, organized response will help mitigate losses. Envision yourself standing in front of your business as firefighters struggle to control a blaze that is consuming everything in its path! control a blaze that is consuming everything in its path! How will you contact your employees? What will you do when they arrive for work? How will you pay them? What do you tell your customers? How will contact with customers be continued and what will you tell them? Where will your business and its communications resources relocate? How will your business retrieve its important files, documents, and equipment if local authorities prevent access to your site? How will managers re-create vital business records? How will department managers recover business functions? How do you handle employee morale issues?